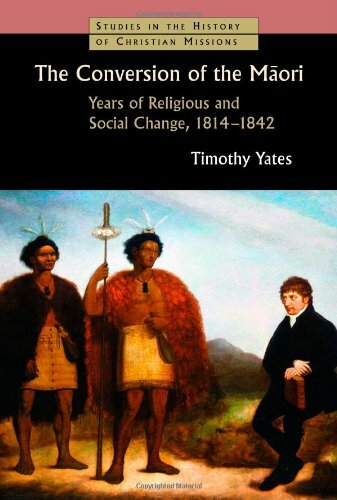 Timothy Yates, The Conversion of the Māori: Years of Religious and Social Change, 1814–1842 (Grand Rapids: Wm. B. Eerdmans, 2013). ISBN 978-0-8028-6945-6. 150pp. When James Hamlin, my great, great grandfather, joined the CMS mission at Paihia in 1826, he came as an artisan lay missionary. His trade was flax dressing. He quickly found that not only was the New Zealand flax a distinctively different species, but also that the Māori knew a great deal more about flax weaving than he did. As a result, his life changed direction. He became a fluent idiomatic Māori linguist able to contribute to the translation of the Scriptures into Māori; he was a trusted mediator and negotiator between warring tribes; he was a faithful catechist and church planter in places where Pākehā rarely penetrated; he was a dogged explorer and a good farmer. In the last years of his long service, Selwyn was finally persuaded against his better judgement to ordain him. (Hamlin, after all, was not a ‘gentleman’.) With his wife, Elizabeth, they had twelve children. Two sons intermarried with local tribes-people so that their descendants reflect the unity in diversity of the meeting of the races in the development of this country. At Captain Symonds request, he called the hui of the Manukau tribes, in the area of Awhitu to witness the Treaty of Waitangi. Te Whero Whero who was present, ensured that few Manukau chiefs signed, since his authority as Māori king and Paramount Chief of Tainui was not to be compromised. Hamlin’s life of undistinguished, faithful service encapsulates many of the questions that any writer on the formative years of the New Zealand mission needs to confront. It is with these questions that I approached Timothy Yates’ book in Eerdmans’ series Studies in the History of Christian Missions (SHCM). Yates’ overview of the development of the Christian mission in New Zealand is a competent survey. It recognises the role of Māori in transmitting the Gospel so that missionaries in newly planted stations already found worshipping communities who had been told the Christian story. This could have been further developed. He deals with the relations between Anglican, Methodist and Catholic missions but may not have adequately considered the fraught nature of the different expectations in each group. He deals judiciously with difficulties relating to inappropriate moral lapses by Kendall, Yates and others and alludes to the tensions people coped with in establishing communities in the bush. My first question relates to the way he interprets his primary source documents. The question is: who were these reports written for and what did they expect to hear? How far were they written to accommodate European attitudes and expectations which may or may not reflect the situation on the ground? To what extent could the recipients grasp what was happening in the encounter between the missionaries and the people of the land? I suspect that a healthy suspicion of what was being written is called for. Secondly, I am interested to know what the effective points of contact were within which the Gospel was able to be shared. What was being offered and what was really being heard? Yates draws attention to the insights into local society and practices that the more insightful missionaries observed which were essential to good understanding and communication. I am interested in the differences the Gospel made in how people lived. Thirdly, I would like to know the tenets of the Gospel that were in the forefront of missionary proclamation, what was heard and the degree to which it was appropriated and internalised. These people had very limited access to resources. Each mission had its catechism and tradition of teaching in books, like Wesley’s Forty Four Sermons or Pearson on the Creed, but few resources beyond these basic texts. All taught through methods of catechesis but in each case the content would be culturally alien to their hearers. There is the further question of the pedagogical value of catechesis as an educational tool. Coupled with this is the role of worship in expanding the mission. Large groups are reported as gathering to worship. What were they doing? How far was worship another expression of traditional spirituality and how far an imposed foreign structure? What was going on? The way in which missionary families lived within the host communities is crucial. The fact that many lived with mutual respect and good will and were trusted is a mark of the practical wisdom many brought to their service. I suspect that their impact was primarily experiential as they lived out the Gospel in community in the tradition of nineteenth century romantic sensibility. A further question relates to extending the missions. One would like to know where the concentrations of population were that led to establishing stations in what are now oddly inaccessible places. Yates did this in discussing siting the initial station at Rangihoua because of the protection Ruatara was able to offer. I would like it more widely considered. The overarching question is: what did the local people hear and what did they make their own? To what extent was the Gospel indigenised and internalised? This question is crucial and finds its high point in the reception of the Treaty of Waitangi itself. The dominant narrative on that occasion utilised the thought forms and cultural images of nineteenth-century evangelical Christianity on issues of covenant and promise, rule and governance, responsibility and citizenship, the rule of law and the place of land. The Treaty could be ratified in many places because those interpreting the terms of the Treaty were trusted in their communities. Like the wider transmission of the Gospel, the Treaty was reinterpreted in local cultural terms in order to be received and accepted. While there is much of interest in Mr Yates’ book, it is written from the perspective of a disengaged observer. Years ago, Archbishop Appleton commented that if he were to have his time as a missionary in Burma over again, he would don a saffron robe and sit and listen for seven years before he began to share the good news of the Gospel. I suspect that more engaged listening would have improved this present study.